We are proud to present to you Sea & Reef’s Phantom Clownfish. This designer clownfish is jaw dropping gorgeous. The Phantom Clownfish is jet black with jagged white snowflake markings. No two fish are alike. 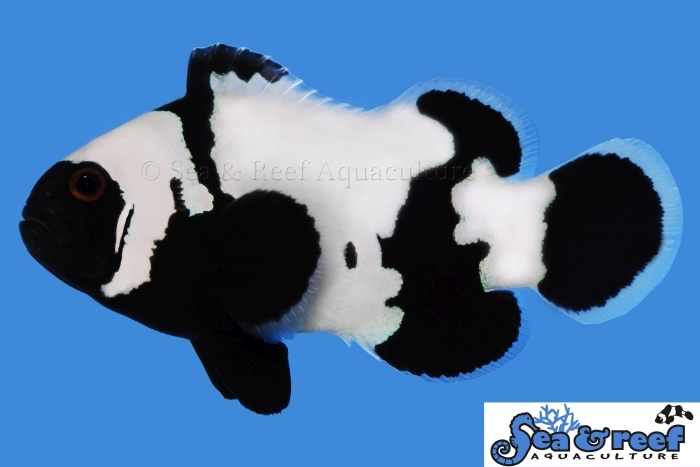 Sea & Reef created the Phantom Clownfish through selective breeding of several of our ocellaris designer clownfish variations including Premium Snowflake Ocellaris Clownfish, Black Ice Clownfish and super black Darwin Ocellaris Clownfish. The goal was to make a jet black clownfish with the desirable white snowflake markings. We carefully selected only the best fish for broodstock and kept close tabs on the genetics to avoid any inbreeding. After many generations and combinations the Phantom Clownfish was born. We gave it the name Phantom Clownfish because the look of this fish evades reality and dwells somewhere on the edge of fantasy and imagination. The black coloration develops identical to Darwin Ocellaris Clownfish. Early juvenile fish are dark brown, but turns jet black when they reach a size of 1 ¼ -1 ½ inches. The temperament and captive care requirements for the Phantom Clownfish is very similar to that of the regular Ocellaris clownfish. It is relatively peaceful and hardy. They thrive in saltwater aquariums with or without an anemone present. Phantom Clownfish will readily accept a wide variety of host anemones and many hobbyists keep them with the popular and hardy Bubble Tip Anemone (Entacmaea quadricolor). As a reference the natural host anemones of the regular ocellaris clownfish are Magnificent Sea Anemone (Heteractis magnifica), Giant Carpet Sea Anemone (Stichodactyla gigantean) and Merten's Carpet Sea Anemone (Stichodactyla mertensii).